Dark themes are the new black, and Microsoft is following the trend with a new look for its productivity app, Microsoft To-Do. 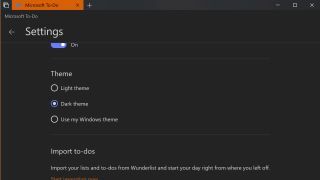 The new To-Do theme was spotted by users signed up to Microsoft's Insider Program, alongside an option to use your current Windows theme (which you can set using the Customization control panel). Apple's next desktop operating system, macOS 10.14 Mojave, will give users the option of switching to a moodier color scheme – a look it proudly claims was inspired by the beauty of the desert at night. Microsoft provides no such explanation, presumably offering the choice simply because it's popular – particularly among software engineers. Windows 10 already has a dark mode for its native applications, and Microsoft has been gradually adding dark themes to its UWP (Unified Windows Platform) apps over the last few months. Microsoft told OnMSFT that the new-look To-Do will be arriving on desktops over the coming weeks, and it will eventually roll out across mobile platforms too.